.. As opening days go, it was fairly typical. It snowed some, it rained some, the sun peeked out some and fish were caught - some. .. The faithful who worshiped at the holy waters were rewarded with blustery weather, crowded waters, wildlife, and a few bugs. Most who came sought the simple pleasures of whipping the water to a froth while waiting for some surface action. .. It's a simple bit of fun. 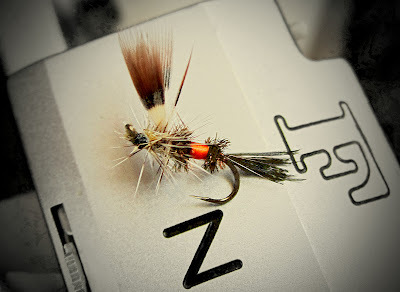 Get your new waders wet in the deep spots where you just kicked out the fish, then cast to a rising fish 50' away. .. The cool weather and the falling snow of the last few days have slowed the runoff to a fishable torrent and the water is clear enough to fish. .. A few sneaky fishers with the wherewithal to find the big fish tucked under the banks used nymphs, streamers, wet flies, and other assorted fluff below the surface. 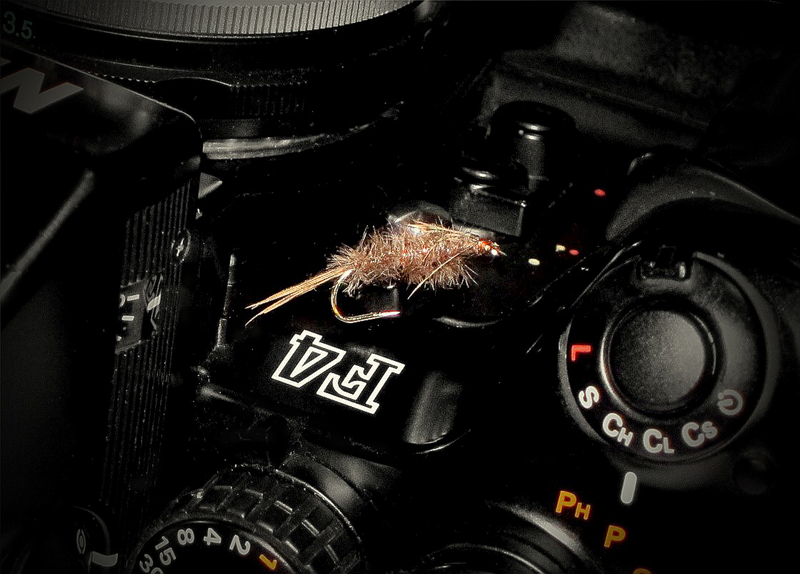 We used a small Spey fly. Fish were caught by most fishers. .. Worshiping and genuflecting was persistent for the whole day. Brief sunny spells punctuated the blustery day while it rained and snowed more than anything else. .. The PMD's showed up about 2:30 PM and the congregation was rewarded for their patience with the howling wind and blinding snow flurries. 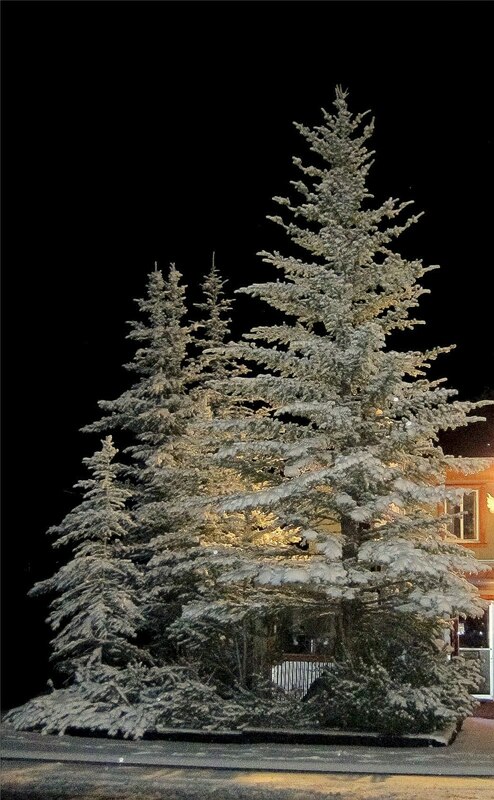 .. Sunday was a repeat of Saturday with more and heavier snowfalls. The bugs appeared again, right after lunch, and drew the magnetized hoards to the water. The Firehole River was the main attraction on the west side of the park. .. Some less-than-social fisher folk noticed that the bear closure signs had been removed from Nez Perce Creek: up they went. Reports of clear water and eager fish rolled down the Mary Mountain trail like ball bearings on a playground slide. There was more snow in the Nez Perce Valley but there seemed to be easier fishing and catching, (for those that care.) It's a pleasure reserved for those who will walk a little farther. .. Rumors of enormous fish, (about the size of oil drums,) have filtered to our ears from the small party of mud fishers that walked the bank of Duck Creek in it's last 1/2 mile before the impoundment and the park line. A fuzzy cell phone image went a long way toward convincing us that even heretics catch fish away from the holy water. .. 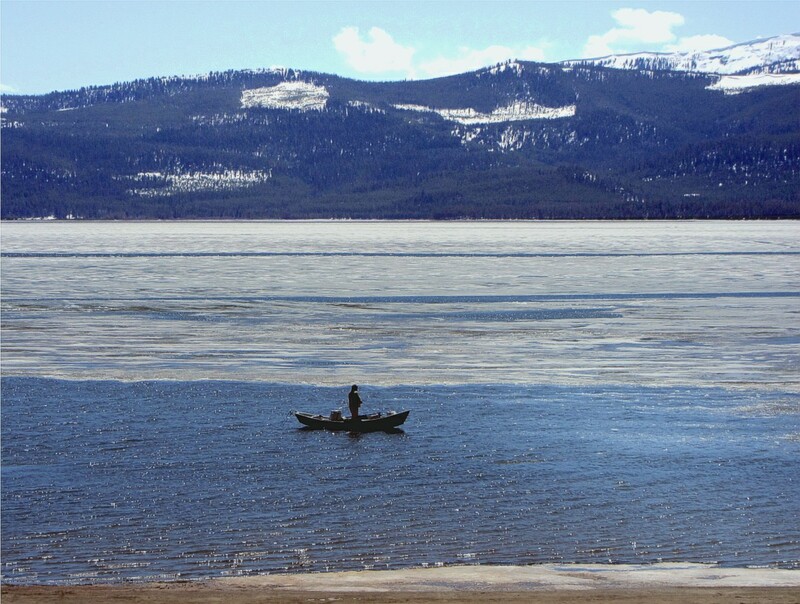 The Madison River drew few fishers and even fewer catchers. Those that knew where the water slowed and the banks were deeply undercut had a field day. The rest just wet their waders. .. As always we'll keep you posted about the fishing and catching. 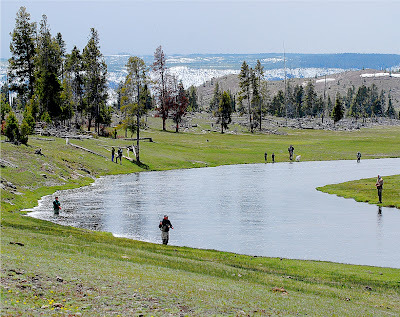 The neighbors will be pissed, the feather merchants will be irked, the rangers will be peevish, (as usual,) & a good time will be had by all while Fly Fishing in Yellowstone National Park. .. 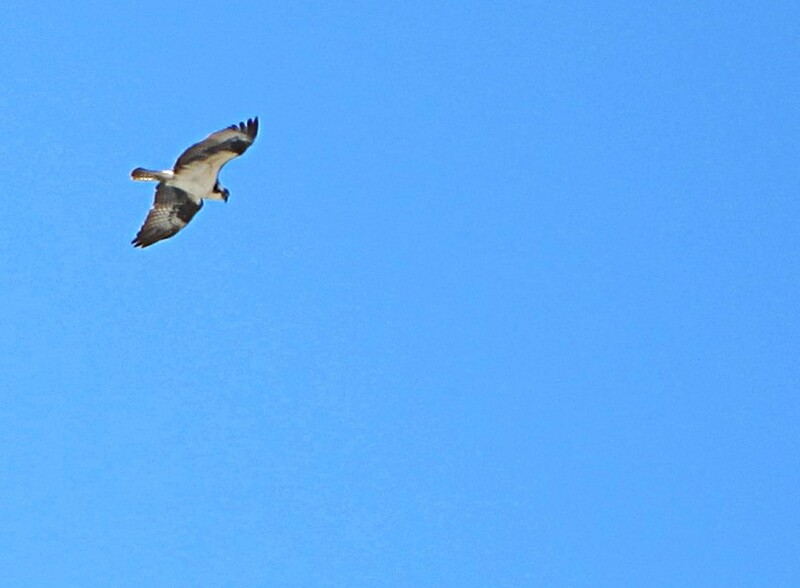 They've been arriving on schedule: just like the swallows at Capistrano. 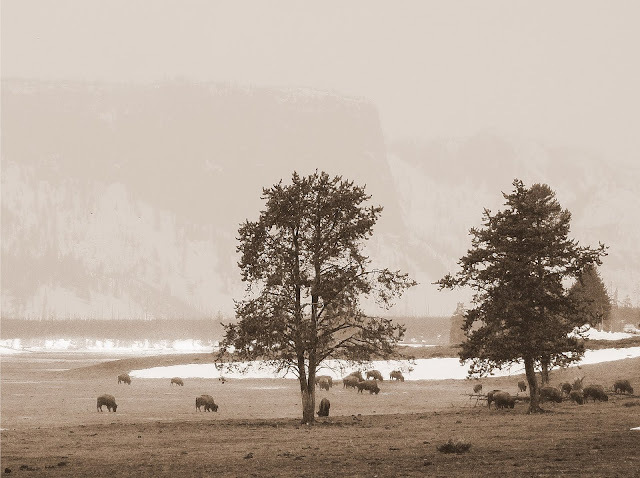 It's an annual migration: from the cluttered lowlands of our nation to the idyllic meadows of Yellowstone. .. Last night while they slept in their cozy motel beds Mom spewed forth a greeting of white stuff for their edification. 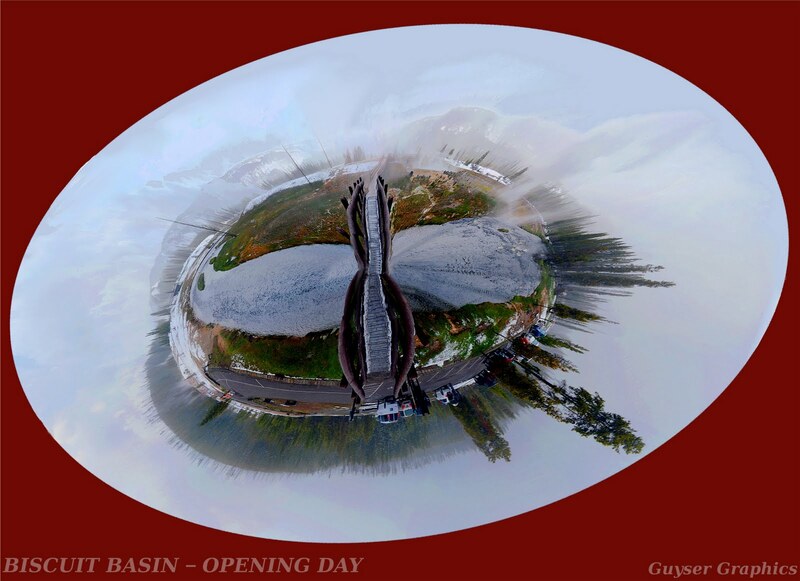 The kind of greeting that is but a foretaste of tomorrow's opening day in Yellowstone National Park. .. For the moment, at least, there is no place in our little village that received more than two feet of snow. The famous rivers of the west side of the park are cool, and their meadows can all be traversed without having to trudge through more than knee deep snow. .. This migration is a ritual that has little to do with fish and much to do with the space between the visitor's ears. 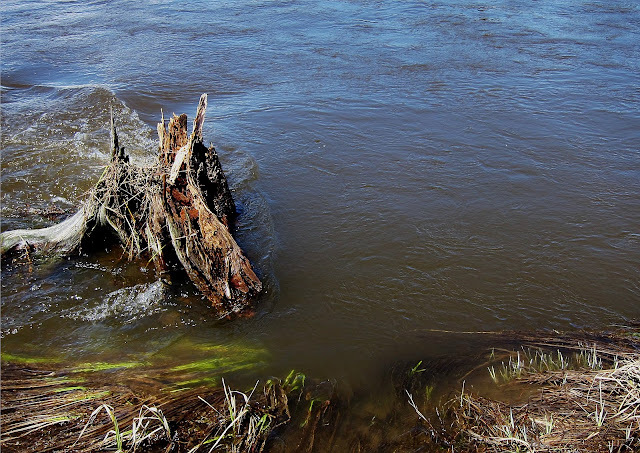 4,] the Madison River has been running at between 500 and 700 cfs above the seasonal average for the last week, and is continuing to pump chocolate sludge into Hebgen Reservoir. 7,] park rangers have a fresh supply of ball point pens and stacks of newly printed citation forms for the visitors that have not read this year's new regulations - or are ignoring them - or have parked poorly in their haste to not catch fish. .. This year opening day will, again, not be about the fish. It's about the ritual, the mentality, the commitment to fish the holy water and conditions be damned! .. This year it's about slogging around frozen meadows and hanging out in the snow doing senseless things that the wife will not let the old codgers do at home. 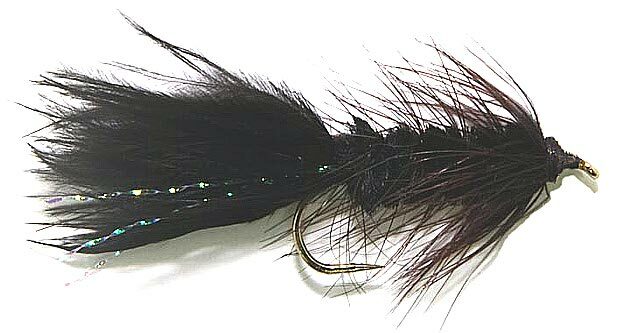 .. We'll take our favorite flies, (guaranteed not to catch fish in the current conditions,) and tie them on with our frozen fingers. We'll have a net with holes bigger than any anticipated fish. We will even take a camera to record beautiful scenery because we know that there will be no fish to pose for a portrait. 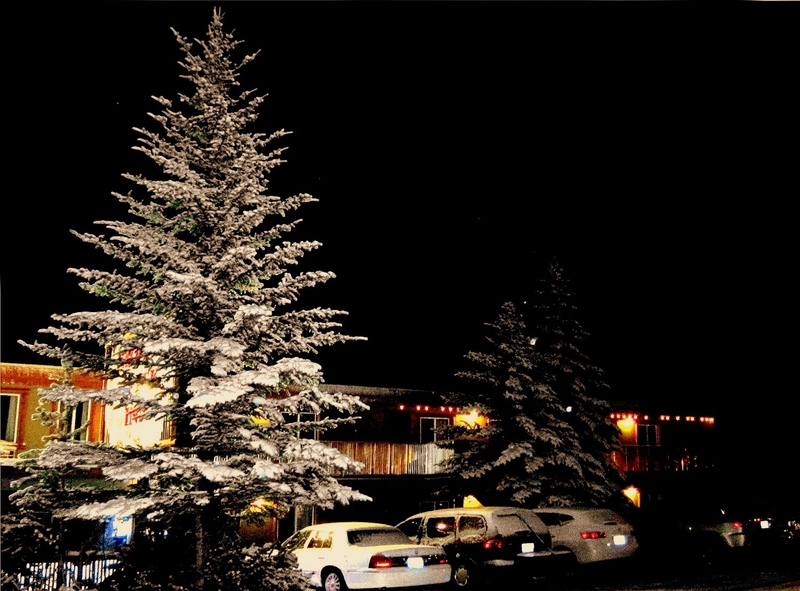 .. We'll be there tomorrow to participate in the snowstorm, the soggy cigars, and the amber liquids. We've been invited to traipse through the tundra with our neighborhood mud-fishers. It will be a day to remember. .. Damn the conditions - full haul ahead! .. We're headed out the door, so this is brief. 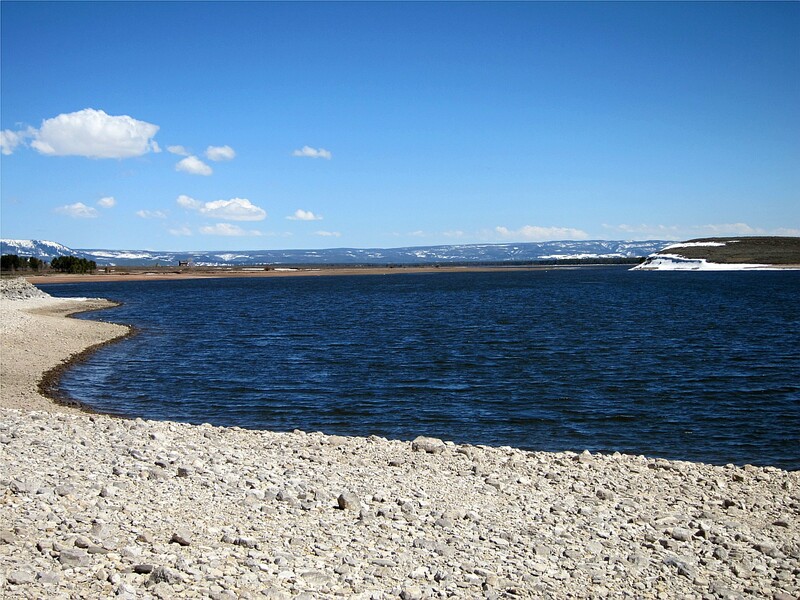 The Madison River, Gibbon River, Firehole River are responding to the recent and continuing rain in a spectacular fashion. There are no official records yet, and we don't look for them for another hour or so, but the water continues to be high and thick, and very muddy. .. "Traditionally" the Firehole River is fishable on opening day, (you can fish any water, but catching possibilities are problematic.) Charts below. .. We'll let you know on Friday where the throngs are going and where the catching might be possible. .. We're in the park daily and are frequently amused by the long-distance reports and prognoses of folks that have a soft easy chair and piles of historical data. The web is full of: "Traditionally," "Usually," "Frequently," "Ought to be . . .," etc. There is no substitute for "WE STUCK OUR THERMOMETER IN THE MUDDY WATER." What's A Fisher To Do? .. Mom has been both loving and cruel this Spring. First she gives us a good snow year that promises to have our rivers running cold well into the summer. Then she throws us a warm spike that takes away a goodly amount of the snow pack. 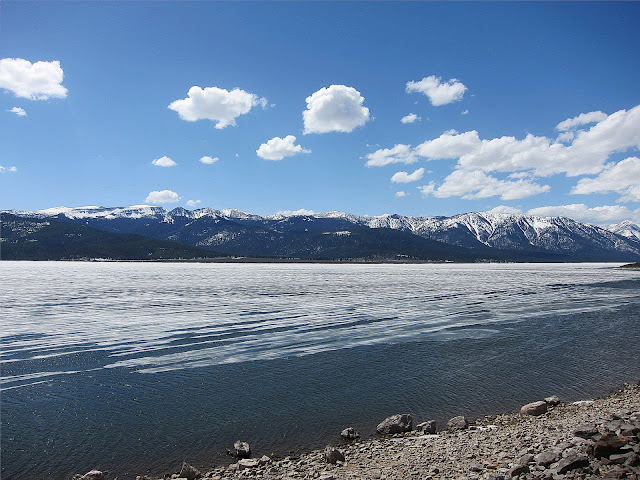 Then just as the ice begins to leave the shores Hebgen Lake she presents us with a rare east wind that pushes the thin ice out of the estuaries. .. The rivers were so high on Saturday that several roads were closed. The most significant was Highway 191 going to Bozeman. Greek Creek expanded to the point that it was not only out of bank, but out of control as well. It flooded the road and caused a road closure for most of the day and well into the evening. .. 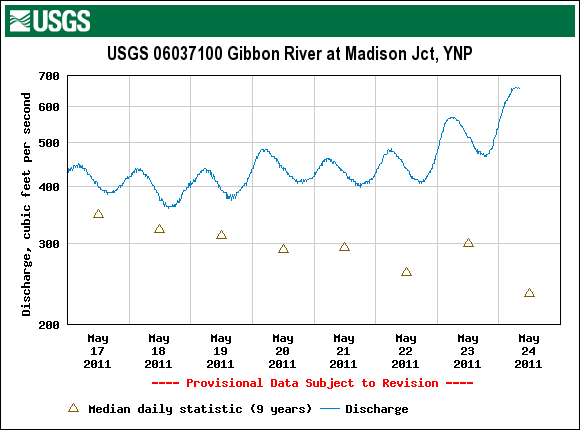 The Madison River is running at a high seasonal average. 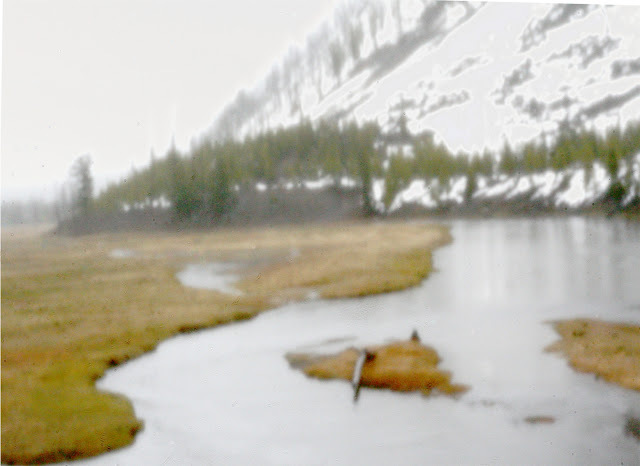 The Firehole River has slowed to seasonal discharge. 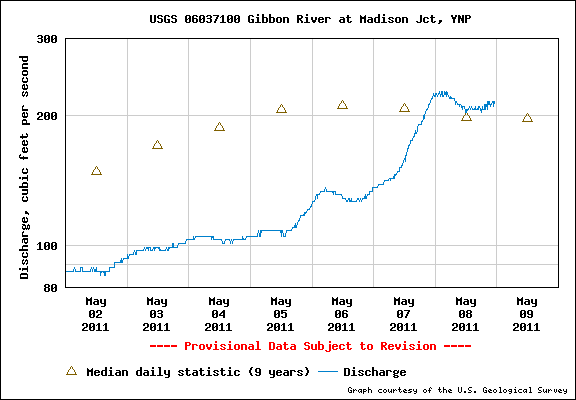 The Gibbon River, on the other hand, is being frisky and flows are all over the place. .. How's the fishing between the lakes? Glad you asked! .. 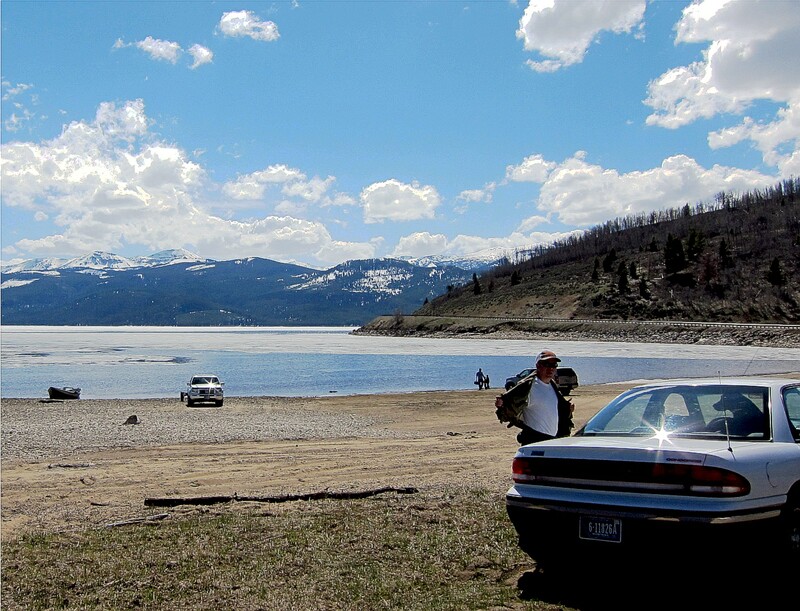 It's fair right now, (and crowded,) - BUT - Hebgen Reservoir's Flood Control Pool is full. Discharge is a moderate but fishable 1,250 cfs. .. The "BUT" is that inflow is 2,200 cfs, and there's only 7 feet left to the spillway. Things are looking pretty bleak for the near future. .. The only good news to be had is that with the rising lake levels the junction of tributary streams and the lake receeds upstream. Technically some places where the neighbors are fishing are illegal. Practically, if you wade the muddy willow bottoms of Grayling Creek, Duck Creek, Cougar Creek, or the South Fork, you deserve the catching - if there is any. .. The lowland Madison River is fishing good. The catching is fair. The color is O.K. and bugs are available. 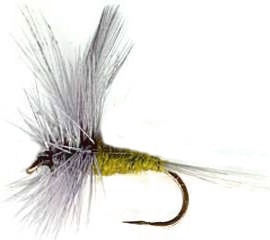 Nymphs and streamers are still in play and shoreline catching is as good as drift boat catching. .. Everything will go to hell quickly if they pull the plug at the dam. It could happen. Or, with current repair crews still working on the intake structure they may just let it fill to the spillway. 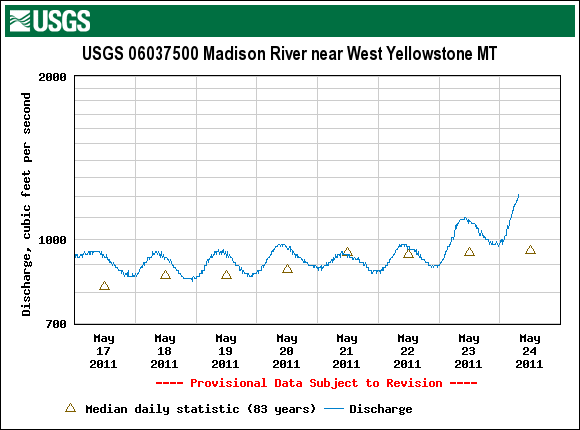 That could happen about the time the Madison River discharge hits it's maximum: this year projected to be near 2,000+ cfs. That's double what it is now. .. We're headed to a little stretch of the Gallatin River that is way too cold to fish. 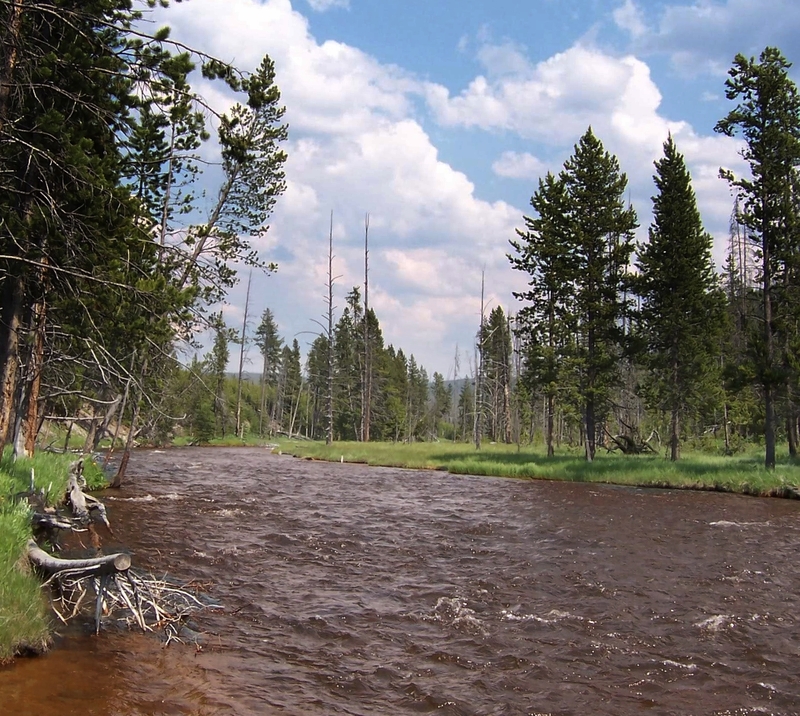 It's that little bit of water between the Yellowstone park-line and Taylor Fork Creek. It's so cold the fish are having trouble holding on to the flies. It's so cold that they are eating anything that seems eatable: sticks, leaves, flies, bare hooks, etc. It's so cold that everyone that fishes there tells you it's too cold to fish! .. 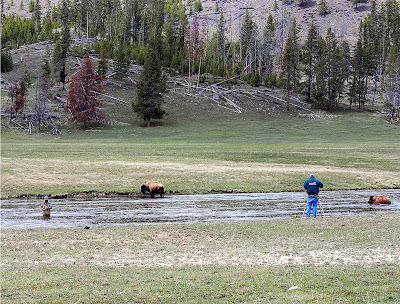 The Saturday of Memorial Day weekend marks the opening of fishing in Yellowstone National Park. This year that is May 28. That's the good news. .. All rivers on the west side of the park are very high. 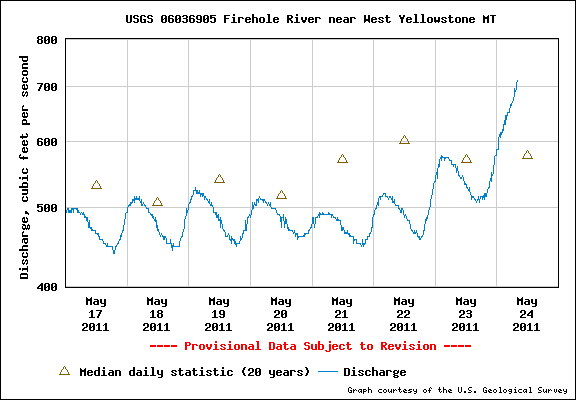 Both the Madison River and the Firehole River are within reach of new record flows, (again.) 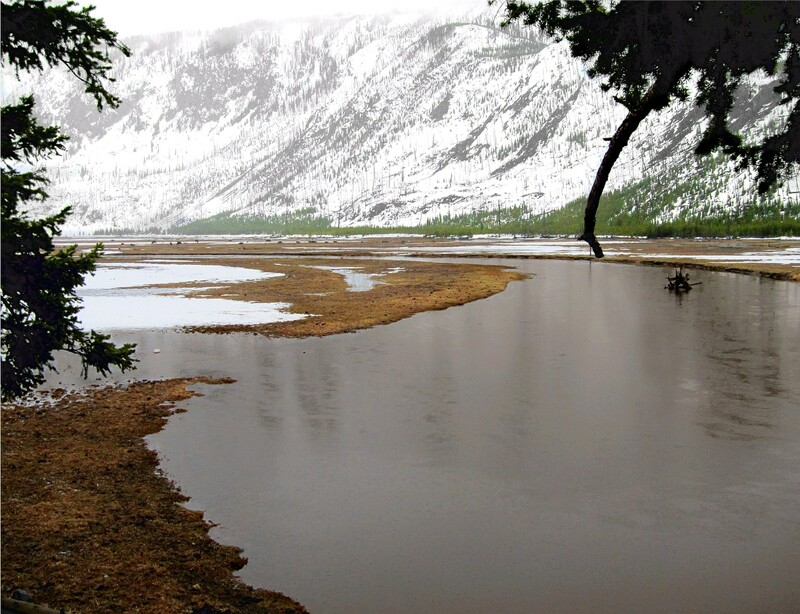 The Gibbon River set an unofficial record on Tuesday. 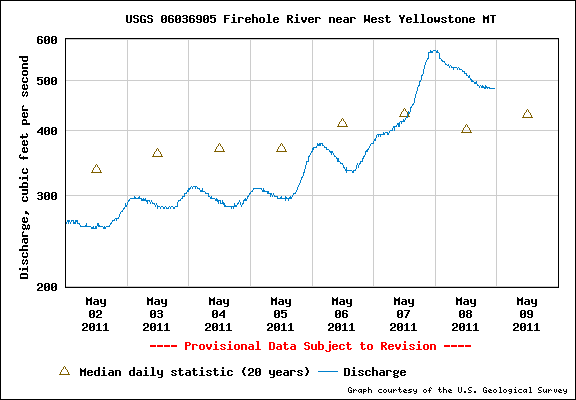 On that same day The Firehole River was within 100 cfs of a record.That's the bad news. .. The beautiful brown, amber, and occasional mauve colors in the water make for interesting photographic exercises - not good for catching. That's the ugly news. .. For the moment "Tea-Stained" is an appropriate comparison. Soon the color will turn to one that is best described by referring to a baby's diapers. In-water visibility is up from just a few days ago to about 8", it's bound to go down again with the next increase in discharge rates. .. 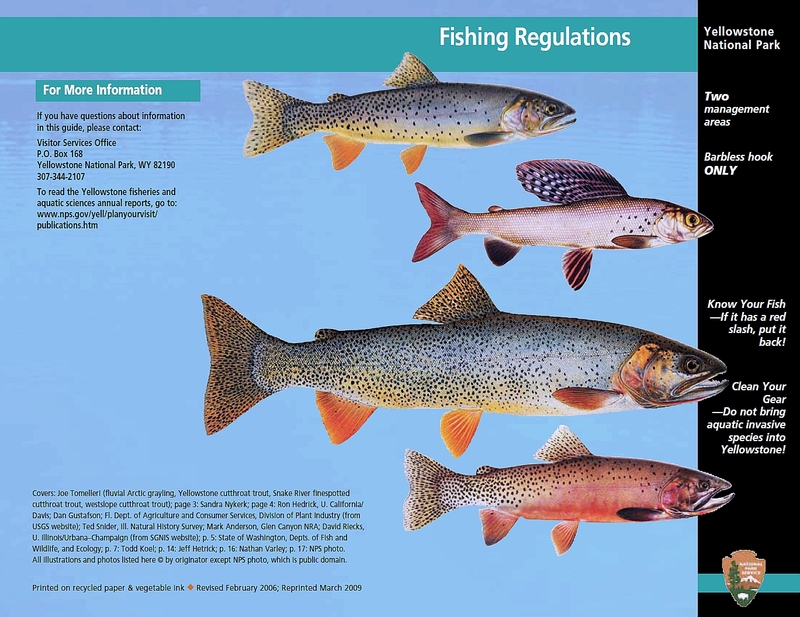 This year the park regulations are emphasizing those regulations that protect native fish. 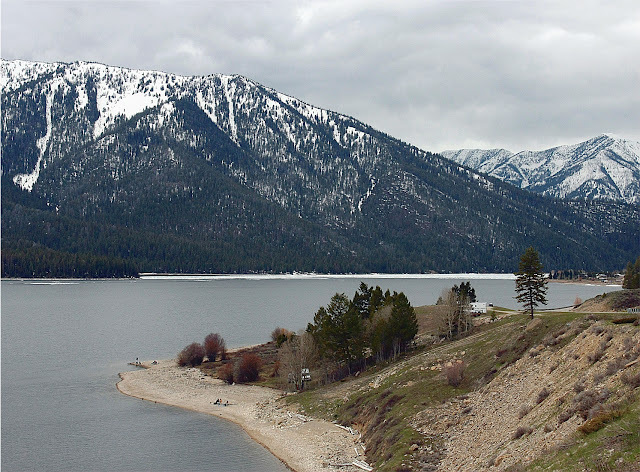 They have raised the harvest limits for Rainbow Trout and Brown Trout in areas where they compete with native Cutthroat and Grayling. .. 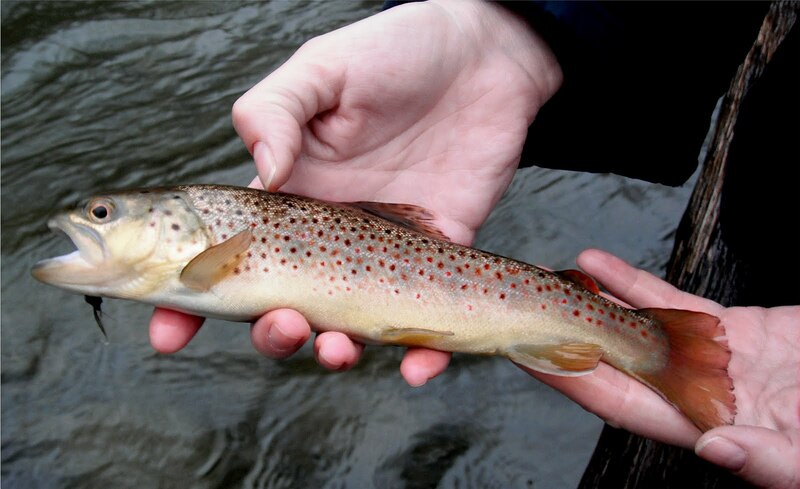 Many fishers, (and guides and feather merchants,) release all trout. It's an unthinking and destructive dogma of their religion. 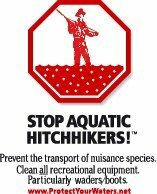 We suggest that you download the regulations, know the harvest limits for where you fish, and kill the invasive species. If all you want to do is catch fish go to a trout farm. .. 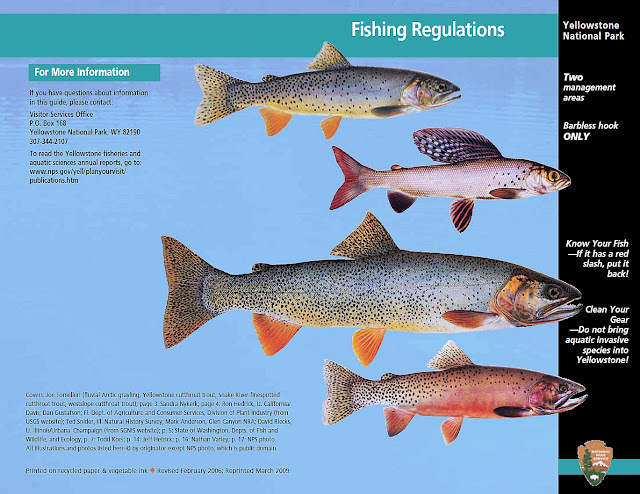 The downloadable regulations (PDF) also contain an expanded section on preventing the spread of other invasive species, (besides the trout.) It's an easy thing to do - be legal and be conservationist. .. 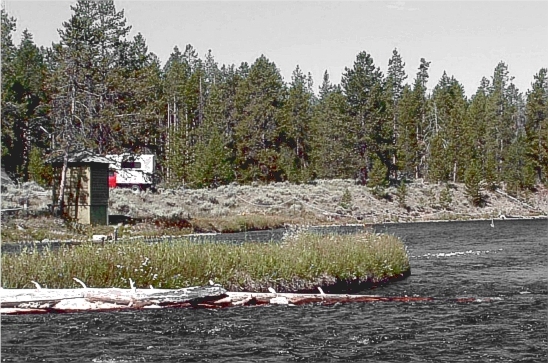 If you have not made reservations for a dwelling space in Gardiner, Jackson, or West Yellowstone, it may be too late. There are still a few places left in the park but they should be fully booked by the end of this week. The rush is on and visitors of the non-fishing variety are already banging the the gates. Last year was another record year for park visitation. This year may be the same. 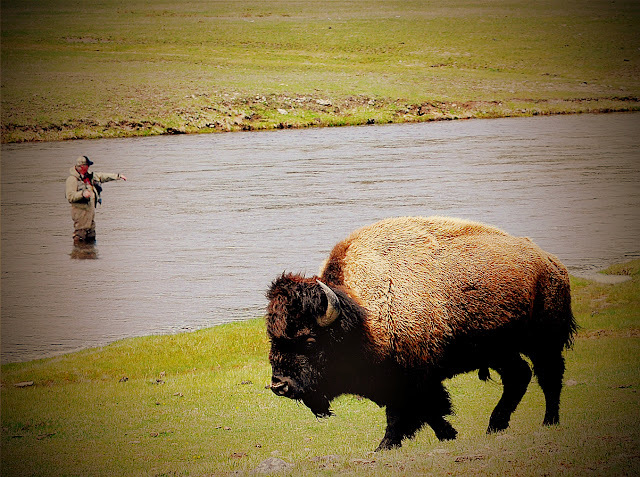 .. We intend to keep a close watch on the waters of the west side of Yellowstone National Park. 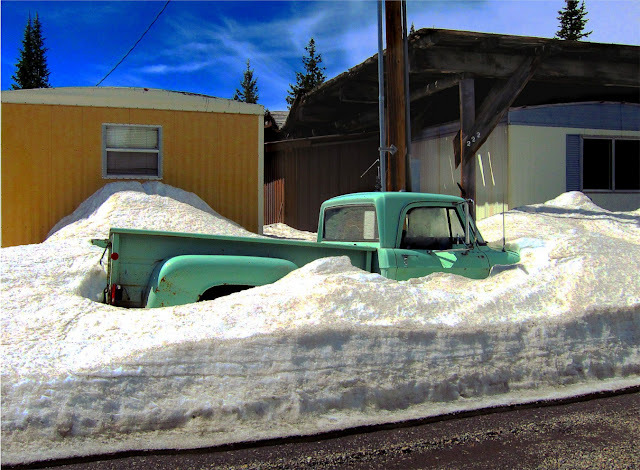 There is still plenty of snow around. The extended forecast calls for temperatures in the high 50's to low 70's with daily rain for the next two weeks. .. As the warm weather continues we anticipate only a few places where the catching will be as good as the fishing. We'll keep you posted. .. It was going to be a gentle day probing the open spots along the shore of Hebgen Lake. Instead, it turned into a fishing frenzy until the zephyrs turned into howling banshees. .. Friday was nice, Saturday was beautiful, Sunday was glorious until about 5:30 PM. By now you should already be packed and headed toward the door. The last four days of sunshine and warm temperatures have brought an instantaneous ice out to Hebgen Lake. ..It truly happened over night. Saturday morning there was fog and there was ice clinging to the shores of the Madison Arm. .. 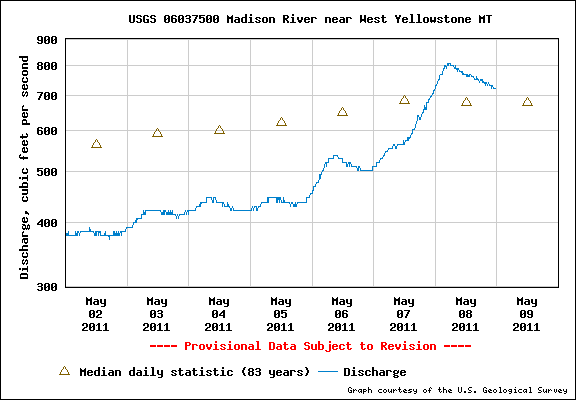 The Madison River is running at about 450 cfs above the seasonal averages and it's plenty warm. It has pushed it's estuary water into the lake proper. 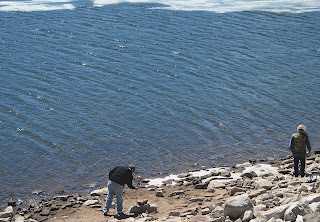 .. By Sunday morning the ice had receded from the shore all the way to the Happy Hour Bar. .. Fishing guides and neighbors, headed for the lowlands, saved enormous amounts of fuel money and halted their fishing trip at the edge of the lake. .. It was not a total surprise, but the easterly winds pushed all the thin ice ahead of them and cleared the whole Madison Arm in a matter of hours. .. Catching was as good as the fishers were. The edge of the ice moved constantly under the persistent shove of the winds. .. The folks with boats had it almost as good as the birds. 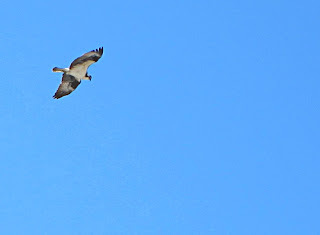 The ospreys hovered above the fishers, at the edge of the ice, all day. .. Shore bound fishers found themselves moving rapidly along the shoreline as the ice pulled away from its anchorage. .. There were very few lawn chairs and even fewer ice chests. There was nothing leisurely about this weekend. The ice moved, the fish appeared, the fisher folk followed: fat trout met their demise, or were reprieved - depending on the sentiments of the angler. 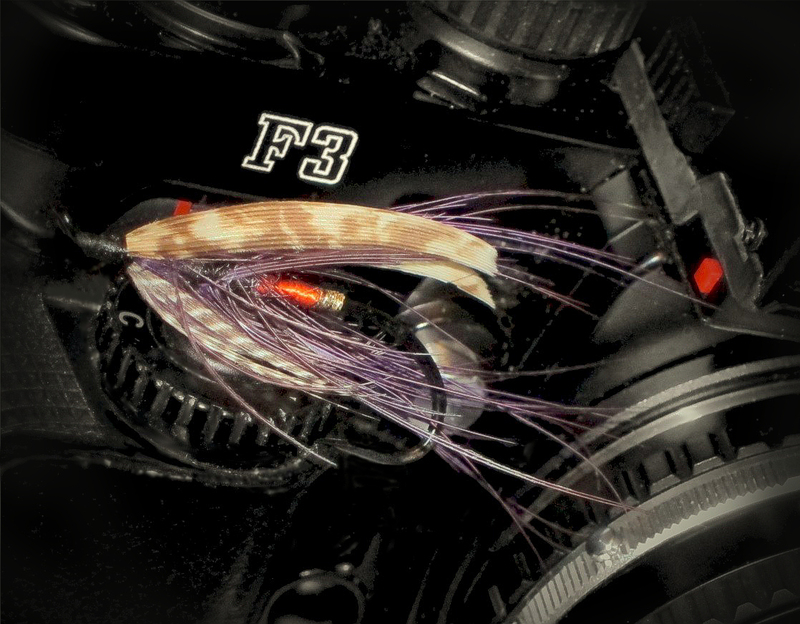 .. As many fish are released by gear goofs as by fly flingers in this ritual of Spring. Mom cooperated, water was available, and until late afternoon on Sunday the most perfect fishing in all the world was on the shores of Hebgen Lake. .. 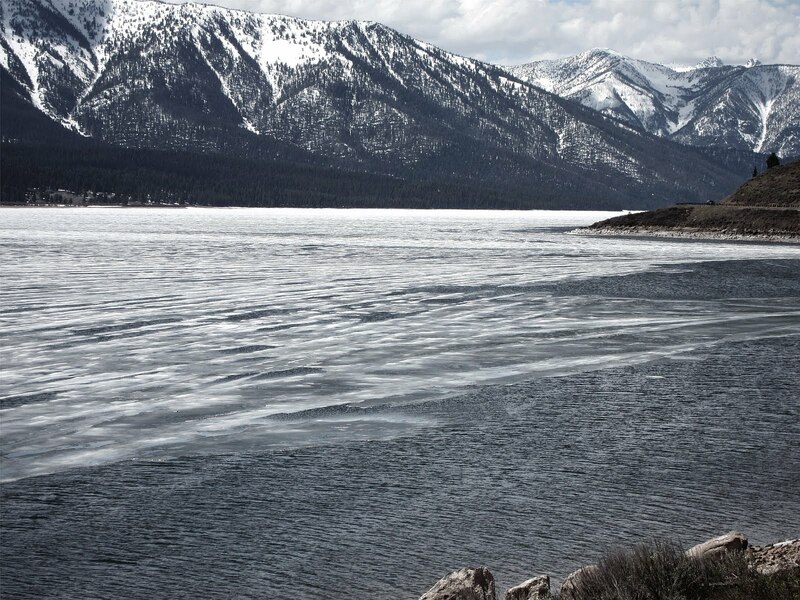 Although fishing and catching will continue to be spectacular for the next week or two, the easiest catching at the edge of the ice will disappear rapidly over the coming few days. It's already hard to cast to the ice with a fly rod, (unless your name is Steve Rajeff.) The gear and bait fishers are also bemoaning the rapid recession although the lead-carried lures and baits are in the "fishy zone" more often than not. .. 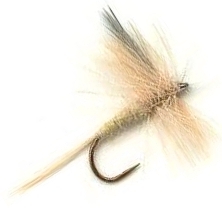 Fly fishers are using Scuds, Woolly Worms, San Juan Worms, Gob-O-Worms, and large double dropped Prince Nymphs. 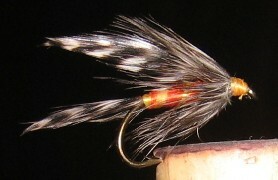 .. Over at Rainbow Point, (yes it's easily accessable now,) they are using Chamois Leech imitations. About 3" is the size on a #8 or even #6 2xl hook. Banging 'em dead they are! .. This is the first time in more than ten years that the thaw has hit with such rapidity. And this is the first time that we recommend that you re-cultivate you friendship with a boat owner this early in the season. All alone? Needs a friend! .. 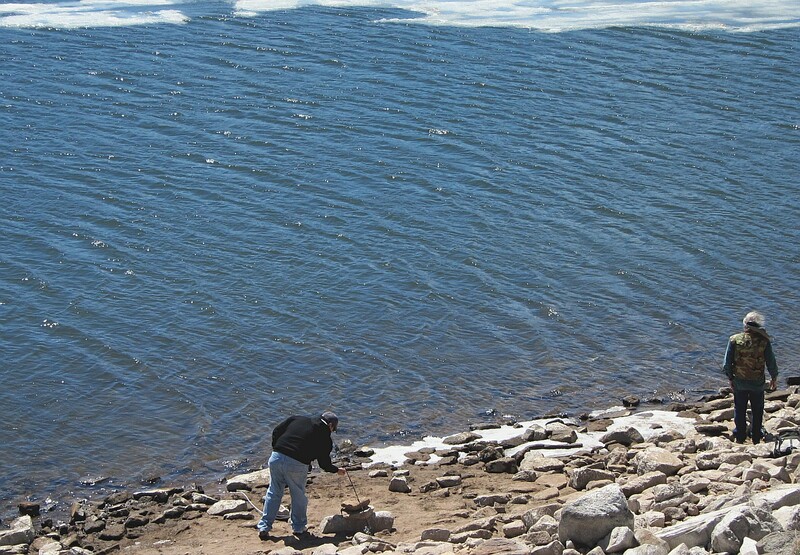 There will continue to be an ice edge to fish. The fishing and catching will be best at the edge of the ice. It will be farther from the shore than any time in recent memory and fishing in a boat will gather up way more fish than fishing from the shore. .. If you're mobile and have waited for this announcement - don't tarry. The celebration is on and the fish are glutenous. If you're not out the door by now you just may miss it! .. 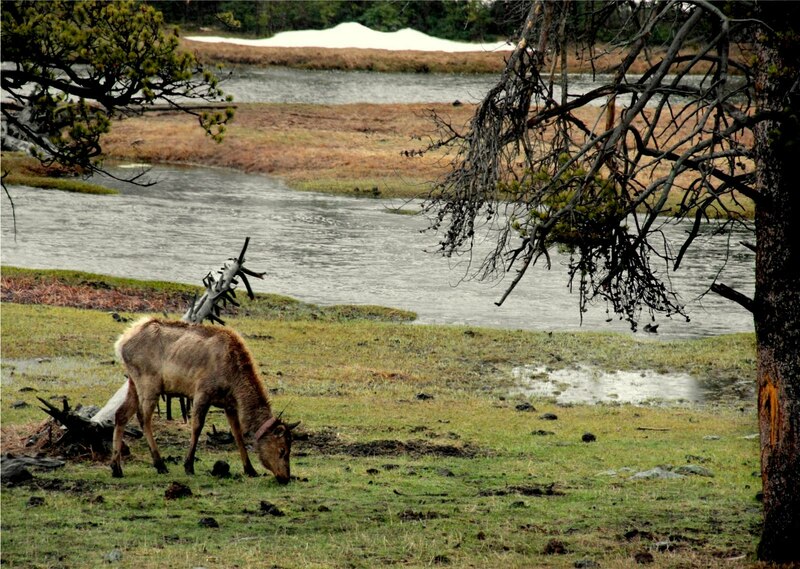 There is some good news and some bad news from Yellowstone National Park. Stay tuned and we'll let you know. .. Right now it's time to put some vinegar on the sunburn. It's also time for some Crêpes folded over Prosciutto, Brie, and thinly sliced Cantaloupe. It's the perfect midnight snack. We may even burn some rum on them and add powdered sugar. .. Should you, like so many of our demented neighbors, demand some "water time" during the muddy season, you will need some local knowledge, a smidgen of luck, and good rain gear. .. There are fish to be caught. After all, fish got'ta eat! They are forced to the banks and undercuts in swollen rivers. They are even in the grass when the rivers get out of bank. .. They are alert, hungry, and just a skosh indiscriminate in their feeding habits. This doesn't mean it's easy. .. They will respond to offerings just a bit larger and noisier than they normally would. They will not chase stuff too far. If you hit them in the nose they will grab your fly. The take can be violent or gentle. Of course you need to know where the fish are in order to pull this off. ..Slow water is the key. 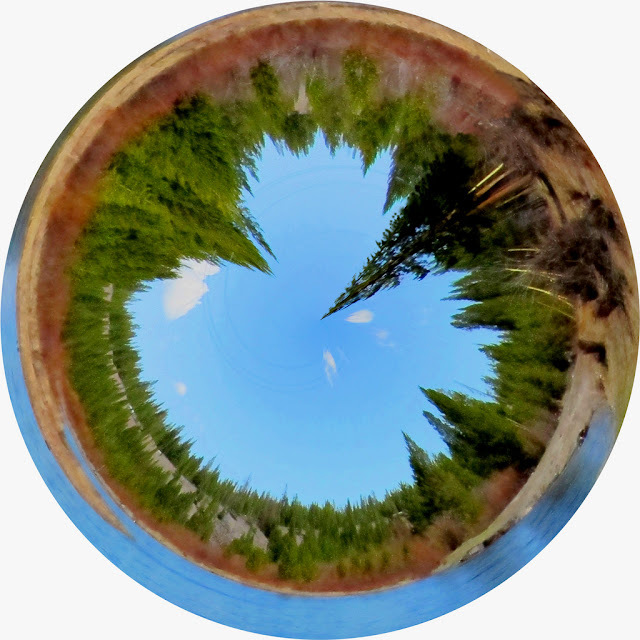 Back eddy's, snag swirls, boulder pockets & pillows, and grassy banks with undercuts are the main hunting areas. .. The neighbors prowl the banks very softly and slowly. 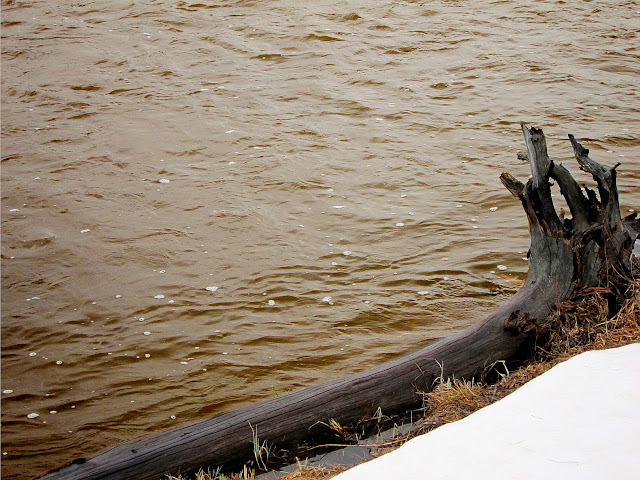 The gelatinous nature of the river bank will transmit vibrations better than when dry. .. A long rod and a short heavy leader are terminal necessities. A fly that can be seen is important too. White or orange, (or both,) are the preferred colors of the neighborhood crazies. .. Casts are short and numerous. The action is akin to strolling along behind a recalcitrant sheep in the Pyrenees. Fishing is usually of the upstream variety although, a couple of the neighbors swear by the downstream drift with a fast sink tip. Seldom is more than 3 or 4 feet of line in the water. .. As the rivers fill and gather sediment they move in new and different courses from the ones during the summer. Often times the big meanders will show cavitation eddy's as they enter the bend. these places are usually dry most of the year. The water here is shallow and slow and often surprisingly clear. .. As the sediment moves into the lake the fish gather and feed on the edges of the debris. This is going on right now in both Hebgen Lake and Quake Lake as Cabin Creek cranks up it's gritty mud. Presentation to edge of the sediment plume will bring results with very little effort. 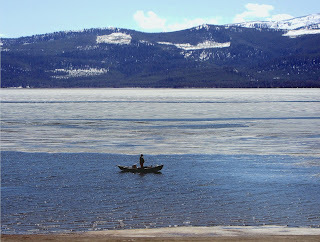 .. We, on rare occasion, are allowed to traipse along with the mud fishers of West Yellowstone. They smoke sodden cigars, wear wool, whisper in the rain, and pause frequently to warm their innards with amber liquids. It's not as grim as it may sound. .. They are out there now. This is their kind of fun. You will see their rigs parked in some of the most unusual places. You may or may not see them. The fish don't. .. There you will find that you can take the boy out of Montana but not Montana out of the boy. .. Nate Schweber has taken his skills and Smurfette to the Delaware River with results to make you jealous. There is also an enlightening post about river etiquette. from last May. Read about that; HERE. 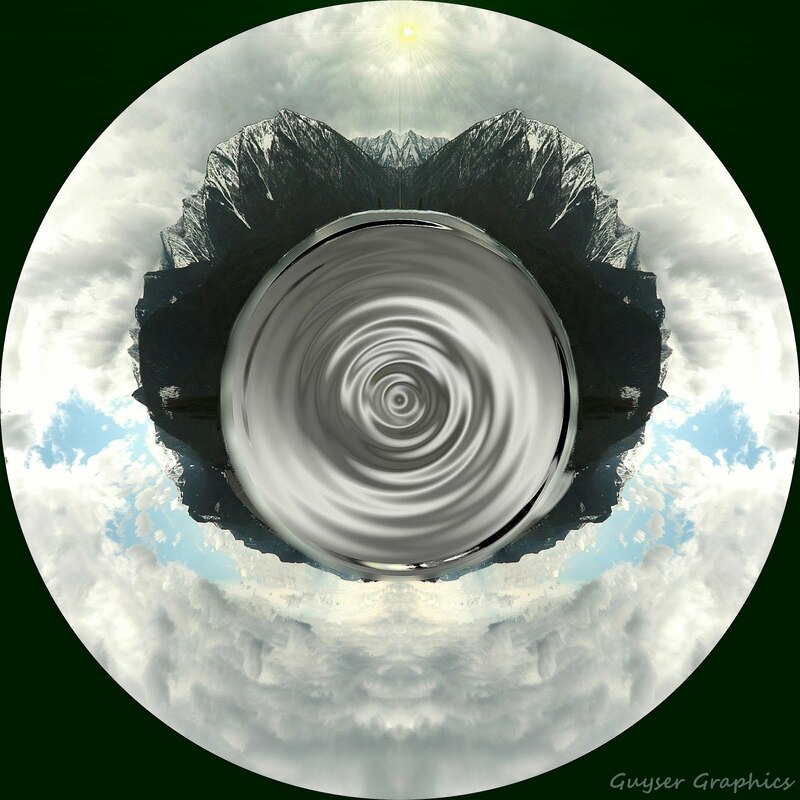 .. Take a moment to click on a song or two. Even from New York there's a Montana soul in the vibe. . . By now the Aztecs would be flinging their children into spring holes. They would be rejoicing for the rain and killing each other in praise of the deities that had guaranteed the success of their crops. For fly fishers it's a bit different. .. The river flow-charts tell the story, and although the Madison River is not quite to the chocolate milk stage; it is, however, "out-of-bank" at 7-mile bridge, (and rising rapidly.) The culprits contributing to this situation, (Firehole and Gibbon,) are turning color rapidly as they top their banks as well. .. The bison and elk are seeking firm footing in the meadows, and there is finally a bit of green grass for them to munch on. Visitors to Yellowstone wonder why the pretty yellow flowers back home are not in evidence here. Well . . . Spring is just a little different in our neighborhood than it is down low where most folks live. .. So then, it's late, there are fish to be had. We'll tell you about it in the near future. Right now there's just time for a chocolate malt and some key lime pie before beddy bye.